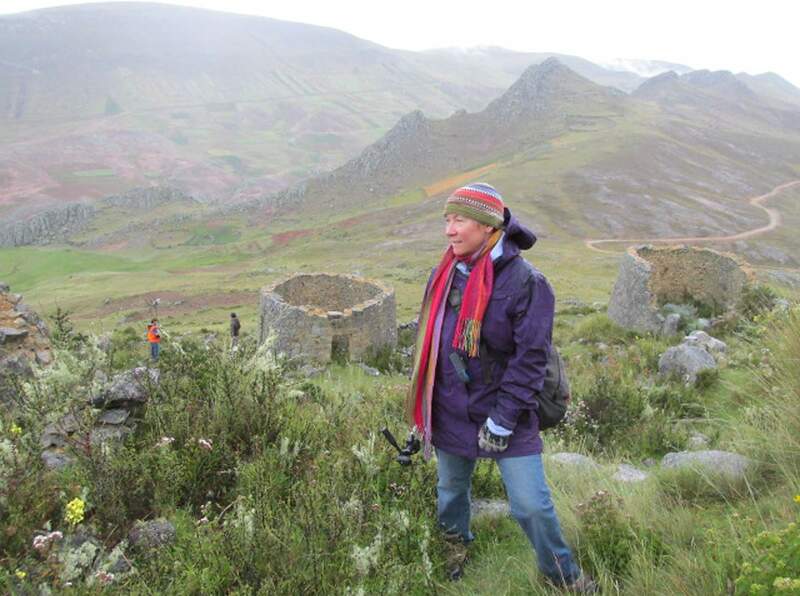 Fort Lewis College psychology professor and Peace Corps volunteer Alane Brown designed a geocaching tour to educate adventure travelers about the environment and cultural history in central Peru, South America. Shutuy Marca ruins are one of the destinations on the tour. 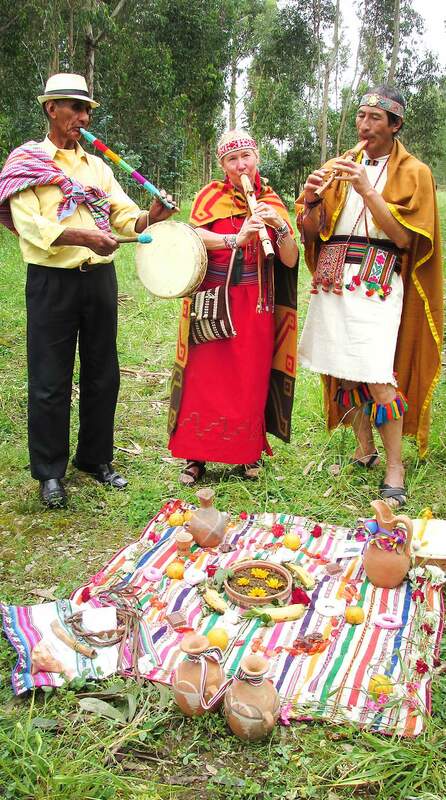 Alane Brown plays music at a cortamonte ceremony with local musicians in Peru. 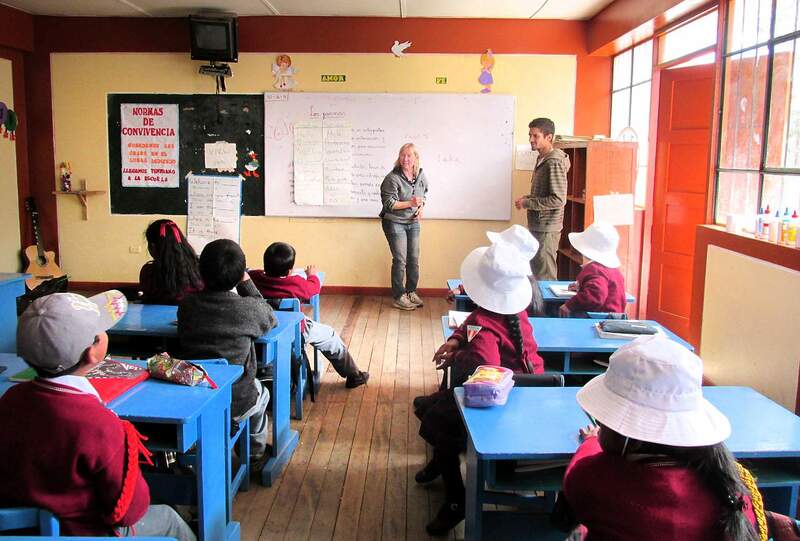 American tourist Arya Afshari helps Alane Brown’s English students practice tourism vocabulary in August in Marco, Peru. Alane Brown’s neighbors in Marco, Peru, gathered in the cemetery during the Santiago Festival to drink beer with the dead in July. 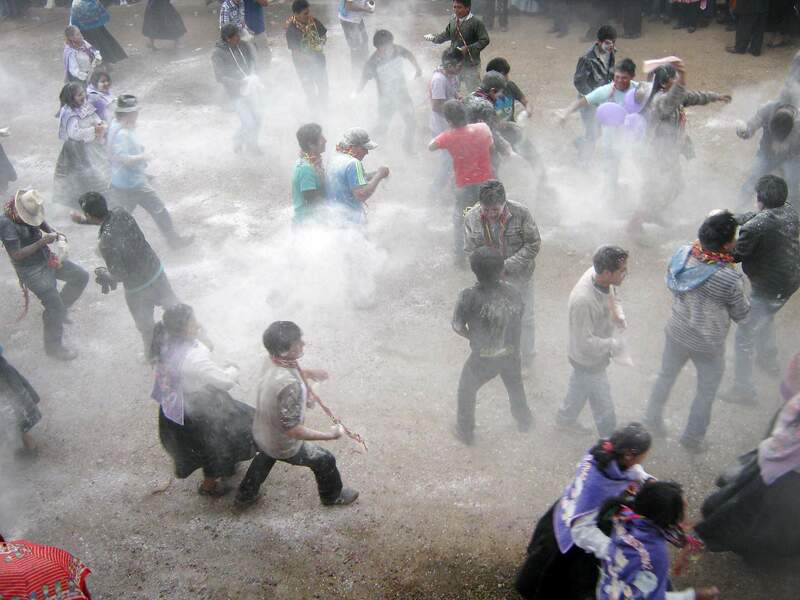 Peace Corps volunteer Alane Brown witnessed a flour fight in Marco, Peru. When Fort Lewis College psychology professor Alane Brown joined the Peace Corps, she couldn’t pick a country or decide what programs to start. In the end, the professor created a tour to attract adventure travelers to the Peruvian community where she lived for two years and worked to protect the watershed. “The two years in site were really hard work. Peace Corps is a roller coaster of excitement, boredom, achievement, frustration and learning,” she wrote about the experience. Rather than bringing outside ideas to her rural region in central Peru, she met with regional leaders to identify community needs and solutions they would support. Peace Corps volunteers do similar work in many developing counties to help them become self-sustaining and increase cross-cultural understanding, said Lauren Dorosz, a regional representative for the corps. Once regions reach a certain level of development, the Peace Corps no longer sends volunteers, she said. Dorosz interviewed Brown, who has worked at FLC since the 1990. Dorosz was impressed by the life and work experience Brown would bring to her assignment working in environmental conservation. “She was very motivated and very passionate,” Dorosz said of Brown, who is now back at FLC. In 2012, Brown was the first volunteer sent to Jauja Province in the Andes. Since then, seven people have started working in the area. A few months after she arrived, she asked the Catholic Church leadership and others involved in environmental conservation to make the Yanamarca Valley, where she worked, a priority. “That took so much courage on my part,” Brown, 55, said. Because of language and cultural barriers, she worried she could not be persuasive and respectful. However, environmental leaders agreed to take action in the valley in the next year. They wanted to protect the watershed in the region from trash and to attract tourists to give the community a reason to value the environment more. When Brown first arrived in Marco, the capital of her district, it was like walking into the past, with adobe homes lining unpaved roads, high levels of malnutrition and widespread disease, partially caused by poor trash collection. She also was struck by all the people taking their cattle, sheep and pigs to and from the fields to graze. “In my town, there was more traffic from farm animals going to their pastures than there were cars,” she said. 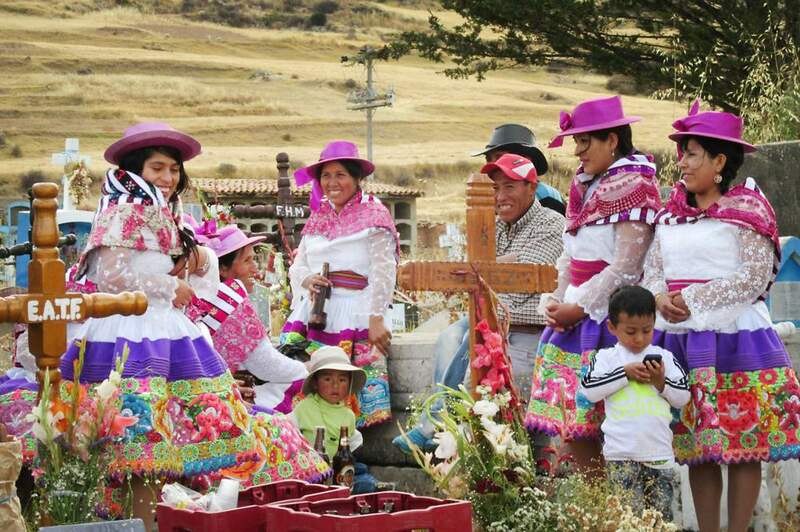 Throughout the soaring green mountains, there also are pre-Incan ruins, small charming villages and people who are willing to share their ancient cultural practices with outsiders. Rather than seeking to create a resort destination or another form of tourism that might harm the fragile environment, she suggested developing adventure tourism. She worked with community elders to create a geocaching tour, the first in South America, with 44 locations highlighting from the best place to watch flamingos to traditional sacred sites. Geocaching, popular in the U.S. and Western Europe, is like treasure hunting for hikers. GPS coordinates for caches are available at geocaching.com, and anyone can seek caches. Now, a group travels to the rural valley about every month to go on the tour with a guide. “People really like it because it’s a very personal experience,” Brown said. As part of preserving the landscape that impresses the tourists, she also worked to improve trash management. With no formal trash-collection system, residents throw trash into the river and streets, bury it in their fields or burn it. Each solution creates a health risk. Trash poisons the river and the soil and spreads disease in the streets. Burning trash, especially plastics in homes, can cause respiratory problems. To help tackle the problem, Brown started a trash study, which is one of the first steps toward getting a trash truck. She also organized community trash collection events to help people understand the scope of the problem. There is now a task force working on trash collection. During her years of service, Brown worked in many other areas. She taught English to young students and green business practices at technical college. She also worked on planting hundreds of trees with community groups, among many other initiatives that are making progress. The geocaching project, in particular, has gained in popularity with tourists who travel to see Machu Picchu and add the tour to their itinerary. To keep the tours running, the community is seeking a sponsoring organization to donate $1,500 to help pay for the website hosting the tour information. To donate or for more information, email Brown at alane@frontier.net.